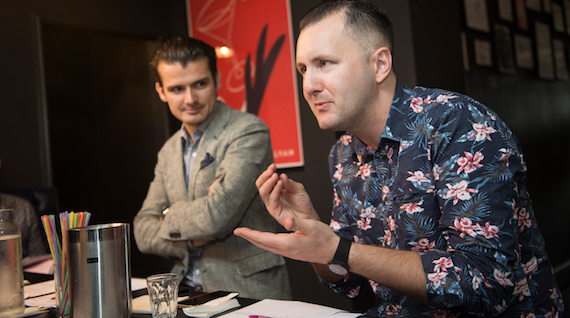 Probably we haven’t shouted about this enough over the decades, but this year, under its new blind-tasted format and with one of the best judging panels assembled to sample cocktails anywhere, ever, we think the Cocktail Challenge will now do the talking all by itself. In developing the World’s 50 Best Bars poll we now have one hell of a black book of contacts. It’s fair to say we pulled in some favours to get Alex Kratena head bartender from three-time champion Artesian (2012-2014); Erik Lorincz, head bartender from American Bar at the Savoy (no.8 in 2014); Ali Burgess, bartender-owner of Happiness Forgets (no.12 in 2014); Iain Griffiths bartender-owner of White Lyan (no.20 in 2014) and Dandelyan, a new entry into the 2015 list; and Guillaume Le Dorner, head bartender of 69 Colebrooke Row (no.23 in 2014). London is full of bars with a meticulous approach to cocktails that would have made great venues for our competition. But perhaps none are as forensic as Ryan Chetiyawardana and Iain Griffiths' White Lyan. 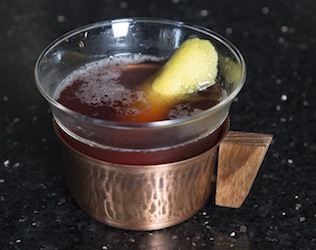 The Hoxton-based bar has made an obsession of examining every element of a drink’s creation. Where better, we thought, than White Lyan to host our competition? And who better than manager Robin Honhold to make the drinks? In previous editions of the Cocktail Challenge brand ambassadors made their own drinks for the Challenge, but this time out we asked brands to provide only recipes. We felt that if the bar manager from one of the best bars in the world can’t make a drink from a recipe, more mainstream bartenders - the ultimate target for many of these serves - are unlikely to fare any better. 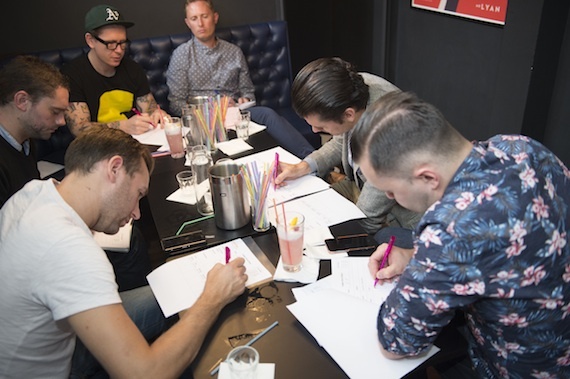 Honhold made 33 drinks that were blind-tasted by judges, who were informed as to the style – the Challenge is split into aperitifs, long drinks and after dinner drinks – and also the category of alcohol that represents the principle ingredient. There were four gold medals awarded, 11 silvers and 13 bronzes. The aperitif round saw eleven medallists: five bronzes, five silvers and a gold. 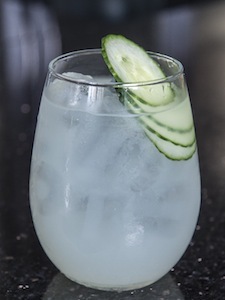 Entered by Pernod Ricard to showcase its Pernod Absinthe brand, the Green Beast won the aperitif trophy and was also named Supreme Champion of the Cocktail Challenge. Artesian’s Kratena described the drink as “super” scoring it 49/50, Happiness Forget’s Burgess said he “loved the drink” while 69 Colebrooke Row’s Le Dorner gave it a perfect 50/50. The judges all loved the Green Beast for its balance and simplicity but asked the brand behind it to tell us how it came about. “Obviously the Green Beast is tasty, light and fresh with ingredients that can be found all over the world and is easy to make for everyone,” said Adrien Fiet, international director heritage & brand experience at Pernod Ricard. As Dandelyan’s Griffiths remarked, the long drink is the most difficult to get right as vessel size and dilution come into play. 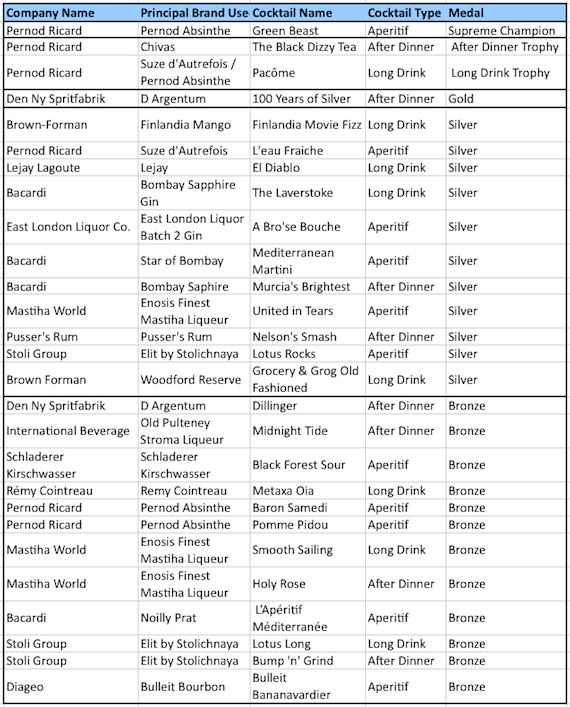 The long drinks category saw four bronzes, four silvers and a gold awarded. The panel gave the trophy to Pacôme, which used Pernod Ricard brands Suze d'Autrefois and Pernod Absinthe. 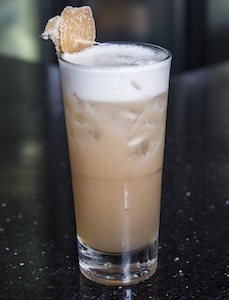 The drink was seen as the best in the category, with an attractive appearance. Dandelyan’s Iain Griffiths said Pacôme is “a really good drink”, Happiness Forget’s Burgess described it as “really tasty” while Artesian’s Kratena said it was the “top” drink of the round as it “develops as you drink”, and has “real intensity”. American Bar’s Lorincz thought it was a “smart flavour combination”. In the after dinner category four bronzes, two silver and two golds were awarded. Den Ny Spritfabrik’s D Argentum drink, 100 Years of Silver, was awarded gold. Made frome D Agentum aquavit, Lillet Blanc, Creme de Cacao and Lemon Juice, Happiness Forgets’ Burgess said it was “limy, crisp, with subtle dill” and “very tasty”. But the Trophy winner of the After Dinner category was fellow gold medallist The Black Dizzy Tea, Josh Reynolds' winning drink from the Chivas Masters cocktail competition earlier this year. American Bar’s Lorincz said the drink “fit the category” and agreed with Colebrooke’s Le Dorner that it was “perfectly balanced”. The triumph meant Pernod Ricard won all three categories at this year's Cocktail Challenge - an outstanding achievement. Add all the ingredients to a Collins glass filled with ice. Take 2 big Koriko tins. Add all ingredients into one tin, add ice, take a hawthorn strainer, leave a little room so the Hawthorn strainer can fit on top of the ice and throw the ingredients from tin to tin 7-8 times - depending on ice - until bubbles form (you'll be able to see the form as you pour the ingredients back into the tin that has the ice in). This will indicate that the correct aeration and dilution has been achieved.